Dave Weesner playing the organ. The organ pipes live behind the white wall pictured here in the background. The organ console of the Mighty Kremer Wonder Organ. 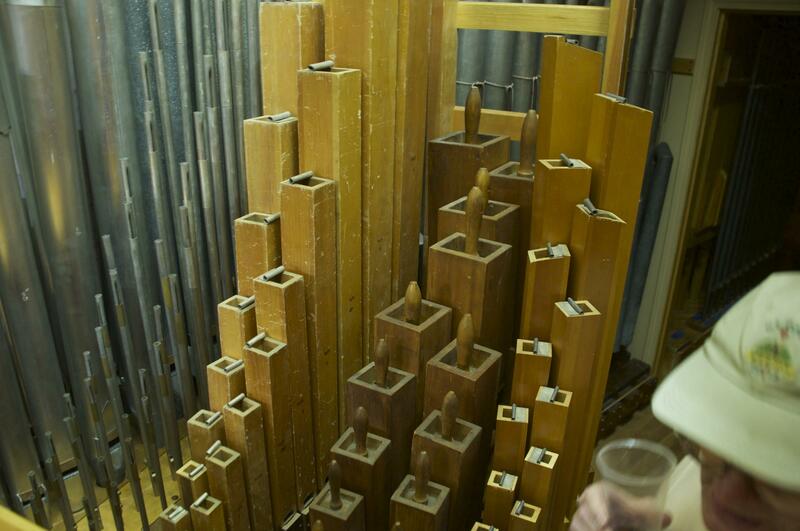 Close up of the organ pipes. 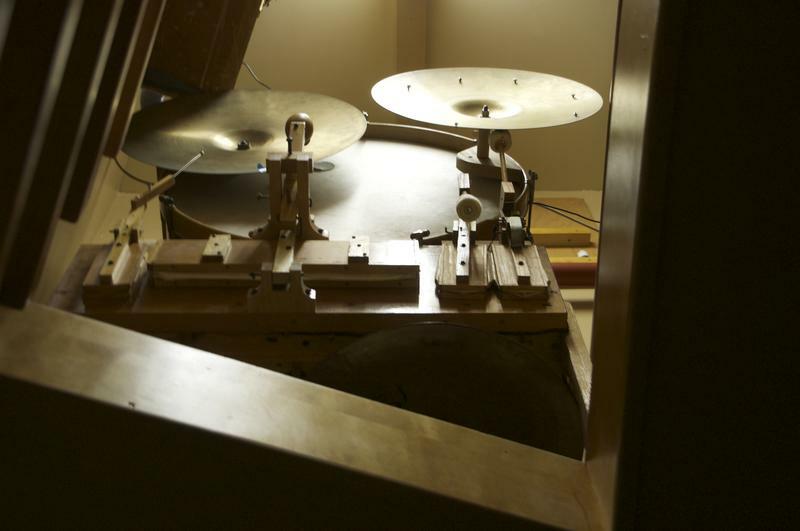 A drumset, which can be triggered from the organ console. 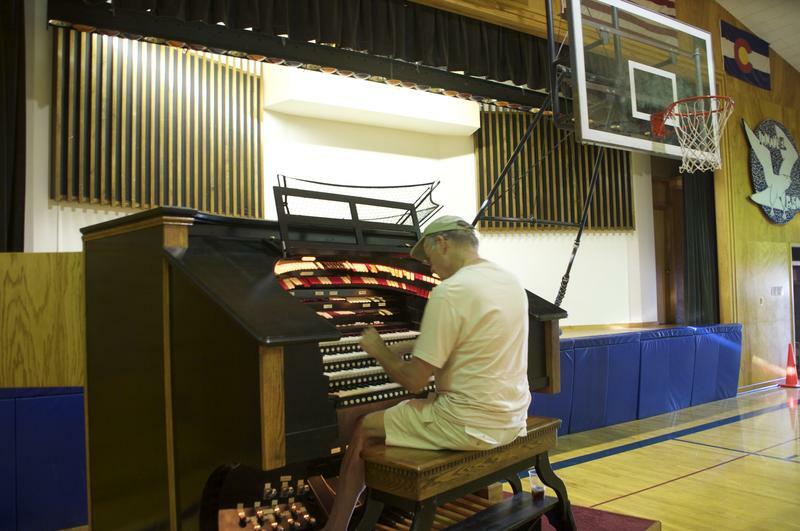 A photograph of Dave Weesner firing up the Kremer Organ for the first time after its installation in the Immanuel Lutheran school gymnasium hangs on the wall in the pipe chamber. Pikes Peak Area Theater Organ Society member Keith Roberts takes a turn on the organ. Attendees at the theater organ society monthly meet-up enjoy refreshments as Keith Roberts plays the organ. 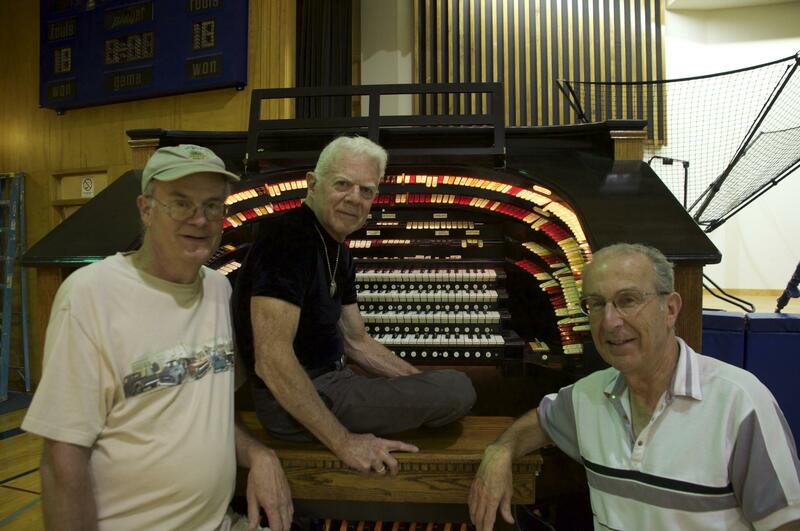 Pikes Peak Area Theater Organ Society Members (left to right) Dave Weesner, Keith Roberts, and Stan Destefan. 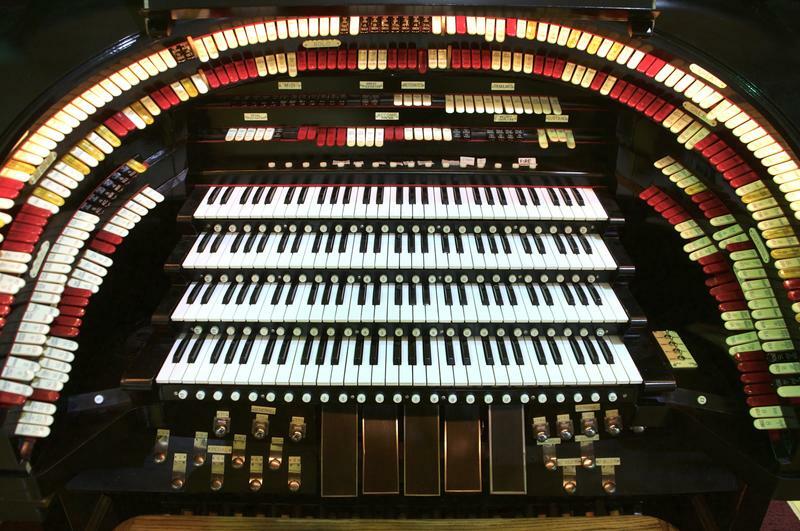 Built by organist Joel Kremer over the course of his lifetime, the Kremer Wonder Organ is composed of roughly 2500 finely-tuned pipes, mechanically controlled bells, whistles, and drums, and a large console with four keyboards and hundreds of buttons and tabs. 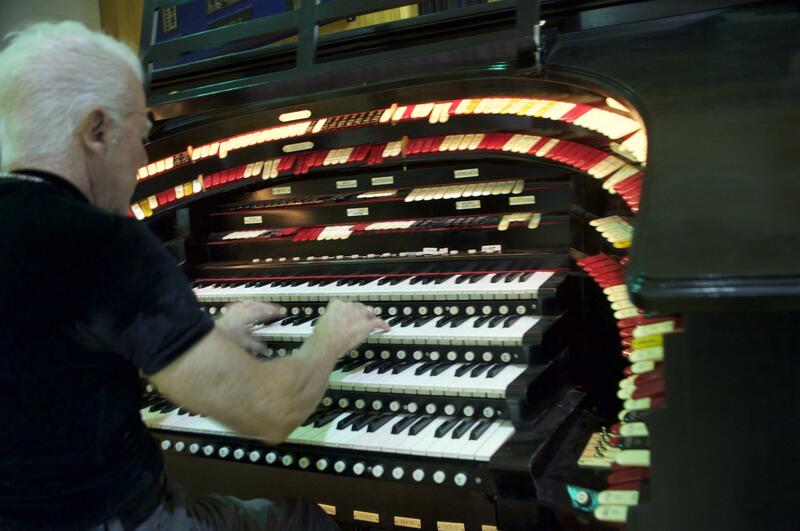 Following Joel Kremer's death in 2000, Colorado Springs resident Dave Weesner purchased the organ with an eye toward preserving the massive instrument. In 2011, Weesner and a small crew of committed organ enthusiasts moved Kremer's organ into the Immanuel Lutheran school gymnasium, and they've been regularly meeting there to work on and play it ever since. "As soon as I saw a multi-keyboarded instrument, especially one with a horseshoe style console that could play an entire orchestra," says Weesner, "I was gone." 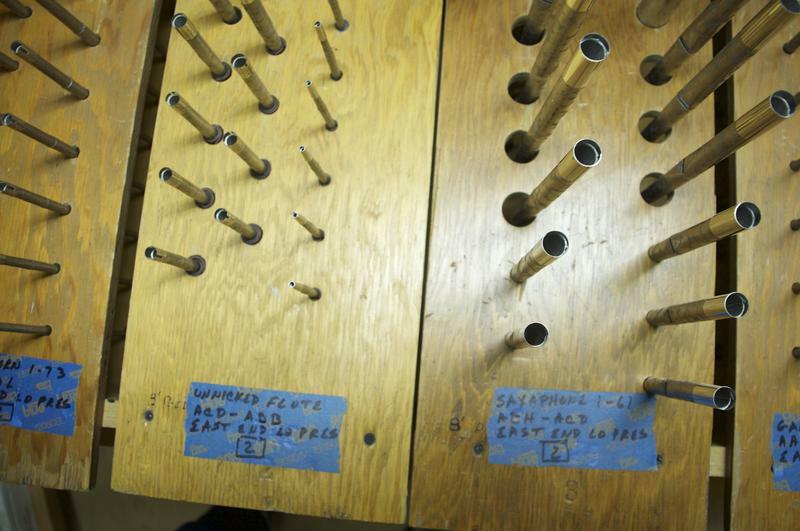 The history of theater pipe organs is long and colorful. Originally called "unit-orchestras," they were invented to accompany the silent films of the early 20th century. 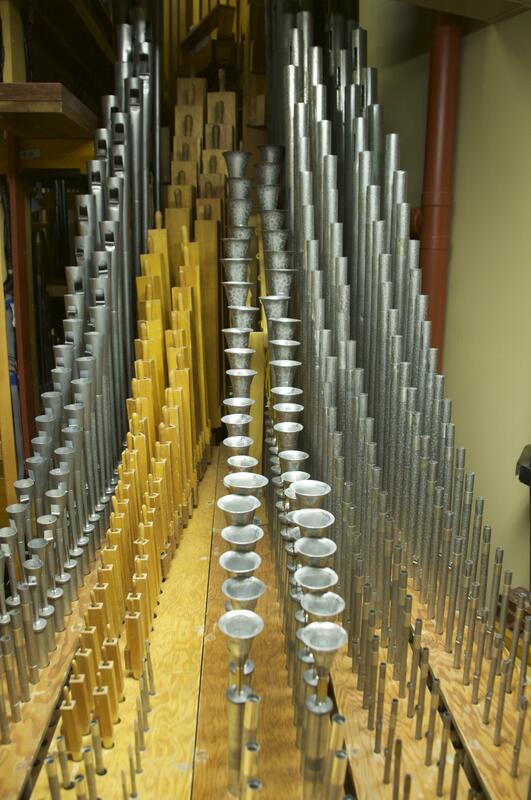 Using pipe organ technology, a theater organ could approximate the sounds of a wide array of instruments -- from tubas and trombones to flutes and saxophones -- all of which could be played by one person seated at an organ console. For roughly three decades, theater organs were fixtures in movie theaters around the country. And then came "talkies"--motion pictures with sound--which swept the nation in the early 1930s, and theater organs became quickly obsolete. In the ensuing decades, as historic theaters that once housed theater organs were torn down or remodeled, many of the instruments therein were scrapped, sold, or otherwise lost to history. Theater organs soon became the province of a small community of die-hards who dedicated themselves to preserving the incredibly complex instruments. Dave Weesner says he first fell in love with theater organs at the age of 10. His mother took him to visit Radio City Music Hall, home to the largest theater organ ever built, and he was transfixed. "As soon as I saw a multi-keyboarded instrument, especially one with a horseshoe style console that could play an entire orchestra," says Weesner, "I was gone." He says he "hasn't been the same ever since." 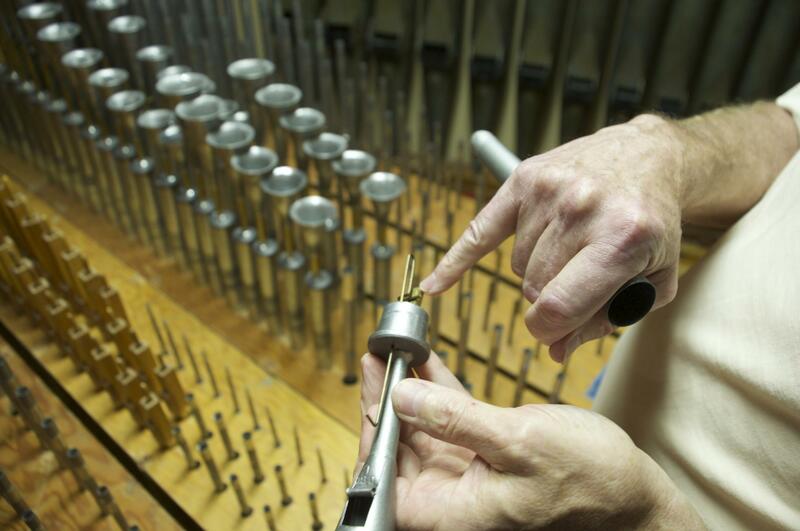 Dave Weesner holds a small tuned pipe in the organ pipe chamber. But Weesner worries about the future of theater organs. He says the number of people who understand and appreciate the instruments is dwindling, and younger people aren't taking to theater organs in the way they once did. "We're all in our 60s and 70s, and we're looking for that next generation of 30- and 40-somethings to come in and fall in love with these instruments and keep saving them," he says. "Otherwise, in a few years, there won't be any left." The Pikes Peak Area Theater Organ Society, of which Dave Weesner is a member, is working to bring that next generation into the fold. 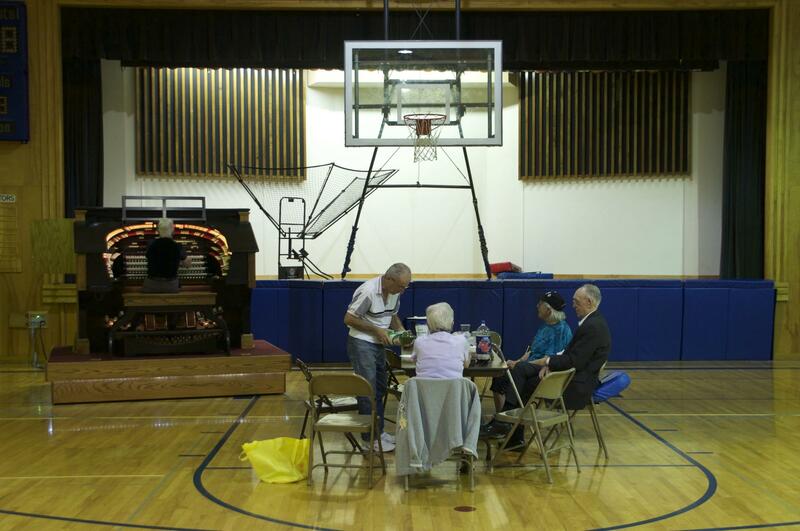 Every month, the group meets at the Immanuel Lutheran School gymnasium and invites the public to join, to listen to and learn about the Kremer organ. For this month's episode of Air Check, 91.5 KRCC attended one of these meet-ups, and members of the PPATOS explained what makes this instrument so special. 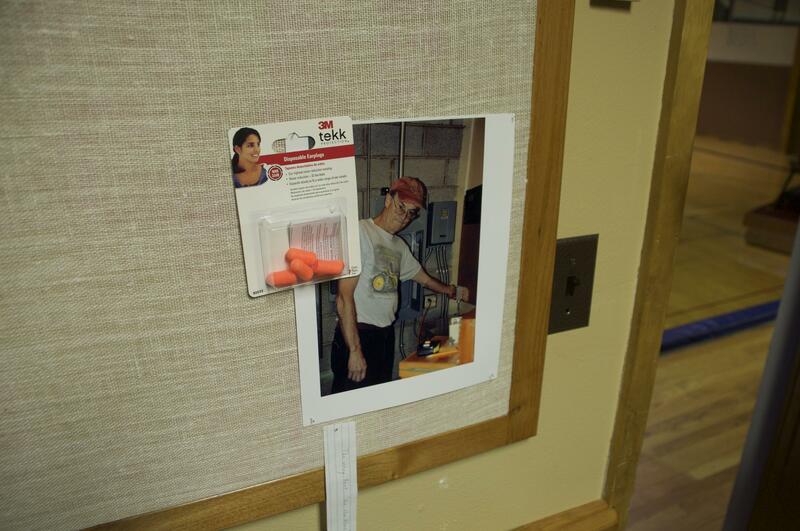 Listen to the story in the player above. If you'd like to see the Kremer Organ in action, you can attend an upcoming screening of "The Hunchback of Notre Dame," which will be accompanied by a live organ score. The screening will take place October 23rd at 2pm at the Immanuel Lutheran school gymnasium. More information is available HERE. 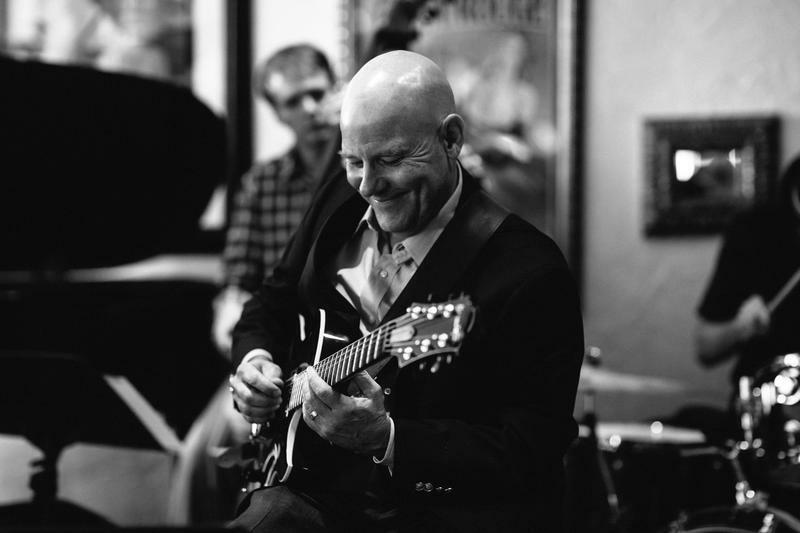 Wayne Wilkinson has played jazz guitar everywhere from the White House to Carnegie Hall, and has even shared the stage with noted tenor saxophonist, former president Bill Clinton. He was a guitarist in the Air Force Falconaires and Airmen of Note bands, and now records and performs both as a soloist and with a wide array of collaborators. 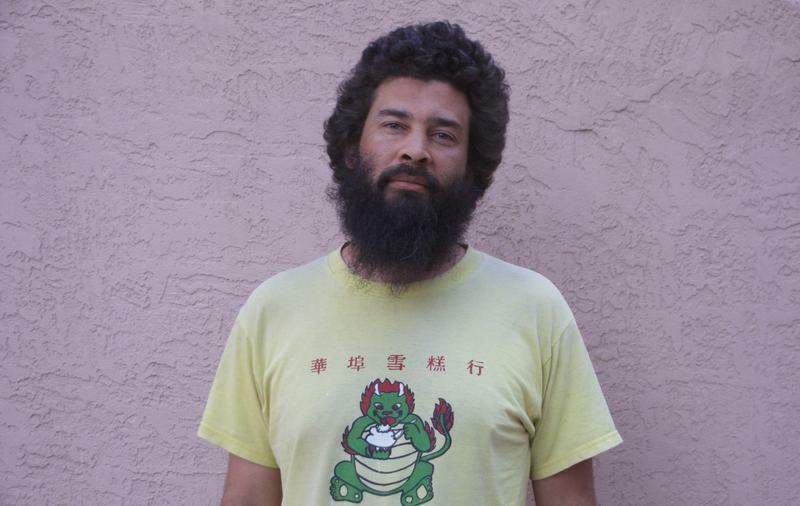 He lives in Colorado Springs, and is a fixture in the local jazz scene. What's it Like to Run an Independent Record Shop in 2016? 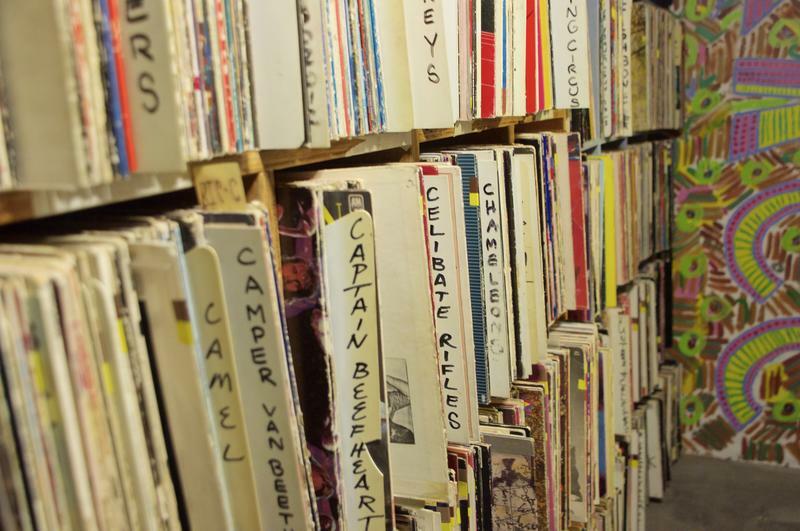 It's no secret that record stores have struggled to survive in the digital age. In the last decade, we've seen music retail giants like Tower Records and Sam Goody file for bankruptcy and watched as the internet has rendered CDs virtually obsolete. For those running record stores, there has been a lot to adjust to.